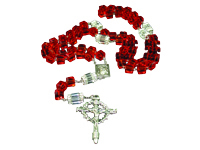 This stunning, heavy-weight chaplet is a devotee favorite when we are on the road, you have to see it to believe it! It is made completely from 8mm square Swarovski crystals with rhinestone caps on the Our Father beads. It is finished with the same Cross and Crown crucifix as our previous chaplet. This is a favorite with the men and ladies alike. It is hand-made and gift boxed as are all our Chaplet beads.